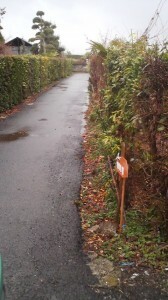 When wandering the backroads of Tsukuba you might encounter a set of what appear to be SIGNS OF WARNING or NO ENTRY. 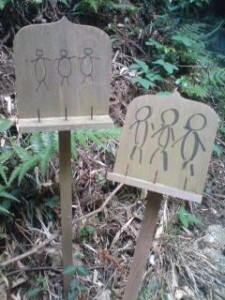 Three primitive stick figures drawn on wooden boards and mounted on sticks, usually posted on each side of the opening to a small road or path. I have never seen these goose-bump-eliciting road-markers anywhere else in Japan, and have STILL NOT been able to find any references to them in Japanese or foreign language sources. Most Japanese I have asked have told me that they had NO IDEA what these were, and several times Japanese friends joining me for a stroll have said “LETS GET OUT OF HERE QUICKLY! THOSE SIGNS GIVE ME THE CREEPS” after coming upon them on a secluded road. Years of asking around eventually led to meeting a few elderly locals who knew what these markers were. Little by little I have been able to clear up the mystery of these mounted stick figures. This EXTREMELY LOCALIZED CUSTOM will now be explained for the first time in English (and maybe Japanese as well). Simply put, the stick figures represent JIZO, one of the most familiar and beloved figures in Buddhist iconography. Anyone who has travelled around Japan and has been to its famous temples has probably seen these monk-like images (sometimes in great numbers), often dressed up by worshippers in shirt, coat, bib or hat, or maybe with some stones piled on them. Jizo, or more respectfully O-Jizo Sama, is a Bodhisattva (one who delays his own Buddha-hood in order to aid in the salvation of others), and because of that has come to be venerated in Japan starting in the Heian period (794-1185). For MUCH MORE DETAILED INFO on just about everything related to Jizo go to this page. 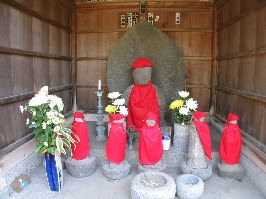 Jizo is regarded as the protector of children (including those who passed away before having been born) and also as a source of solace for dead souls. The interesting thing around these parts is that when someone passes away, the neighborhood committee (in charge of helping with funerals) prepares these uniquely rustic Jizo figures (even if there are stone Jizos in the cemetery). 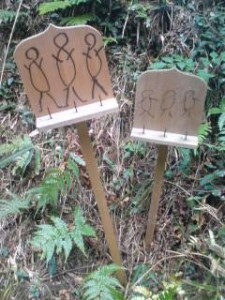 The stick figure Jizo placards are set up at the entrance to roads which lead to the cemetery, as a set of two, each with three Jizo characters. This is because Jizos are often found as a set of six, with that number being of great significance in Buddhism. The graveyard Jizos represent the SIX REALMS OF EXISTENCE, or SIX PATHS (rokudo). The custom of setting up these signboards began with the intention of helping guide the dead souls to wherever it is they have to go. If you look at the photos I have taken, you can see three nails sticking out of each board. Sometimes there are candles fastened onto them (to guide the dead) and sometimes even chili peppers (which serve as imitation flames). 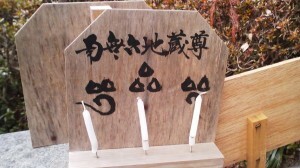 A more practical purpose served by these Jizo boards is helping to guide the Living to the graveyard, which can often be hard to find out in the country. 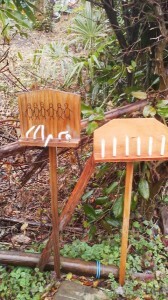 The jizo placards mark the entrance to the paths or roads leading to the cemetery. 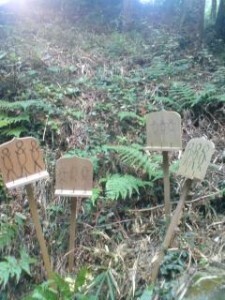 So, next time you come across these strangely primitive markers, don’t run away! It’s not black magic or voodoo. 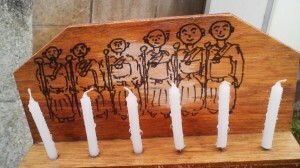 It’s just jizo, helping the spirits on their way.